I only learned about a month ago that this exists. Mike had written to Sideshow Collectibles and offered to review their Apatosaurus maquette if they’d send him a review copy. The folks at Sideshow were game, and would have sent Mike a complimentary review copy and covered the shipping. But the import fees would have been appalling, so Mike very generously suggested that they send it to me instead. And here we are. 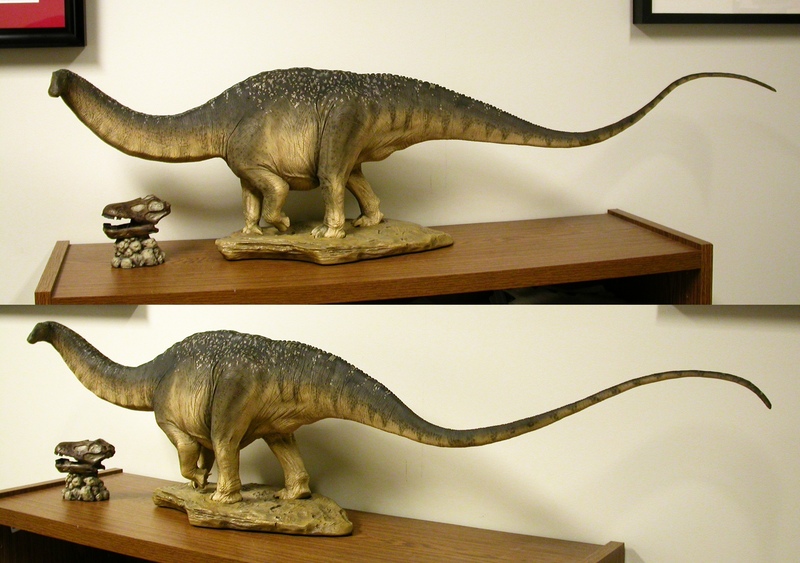 I’m grateful for the opportunity to review the Sideshow Apatosaurus maquette, not only because it’s a nice piece of kit that looks great in my office, but also because it gives me the opportunity to discuss some aspects of sauropod anatomy and behavior that haven’t come up here at SV-POW! before. Some of these are right on the cutting edge of sauropod paleobiology, and hopefully they’ll be good fodder for discussion. As usual, what started in my mind as a fairly brief series of comments metastasized into something ponderous, so I’m breaking up the review into a series of posts, each of which will deal with different aspects of anatomy, function, and behavior. Links to the rest of the series are at the bottom of this post. Something that looms over any review is the problem of objectivity, especially when the reviewer has received a complimentary copy of the review item. Maybe I’m a bit paranoid about this; after all, complimentary review copies are SOP for technical reviews in many fields, including reviews of academic books. In any case, I’ve been blathering about dinosaurs in public for many years now, so anything I say in this review series can be checked against what I’ve said before on the same topics. Also, I reference a lot of published work in the upcoming posts, so you won’t have to take my word where most points are concerned. Finally, insofar as possible, I’ll try to keep my personal opinions about the Apatosaurus maquette out of the main series of posts. I’ll tell you what I personally think about it–beyond the fact that it’s “a nice piece of kit”–in the conclusion to the series. Well I haven’t been sent a complimentary copy, so I can say without bias that it looks absolutely gorgeous and I want one! I would have but one anatomical gripe (with the hand) but I’m sure you’ll get to it so I won’t steal your thunder here. Also, it is not quite usual to restore the shoulder hump HIGHER than the hip (sacral region) for diplodocid sauropods. Either the ribs are bent “a lot” as in Greg Paul’s ceratopsians, or the epaxial muscles are really highly developed. Interesting. I didn’t read it as a “shoulder hump”, just as a convex curve to the dorsal vertebrae, which does not require crazy bent ribs or honkin’ epaxial muscles–see, for example, Gilmore’s Diplodocus skeletal restoration here. It can’t be giant epaxial muscles defining the dorsal margin of the body, because there are little bumps along the back for the neural spines of the vertebrae. Anyway, that’s all material for future posts, so I’m going to say no more for now (on those topics, anyway). Please keep the comments coming–I know what I think about this thing, and I’m very curious to hear what everyone else thinks, too. Yes, it seems the the epaxial muscle explanation is unlikely. However, w.r.t. Gilmore’s second (below one) restoration, how could we justify that the scapulocoracoid be placed on two quite different positions on the same and similarly posed dorsal ribs (not least without becoming more vertically oriented, for example? then and again, the glenoid would disarticulate). In addition, the second pose results in a(n expectable) “break” at the sacrocaudal vertebral junction, though hidden behind the ilium. Conclusion: the first restoration (w/o dwelling into the tail raising issue) is much more plausible, and hence this model may be a bit of wishful thinking (personal opinion only, no offense intended. it is overall quite beautiful). The reverse keystoning of sauropod sacra is…weird. 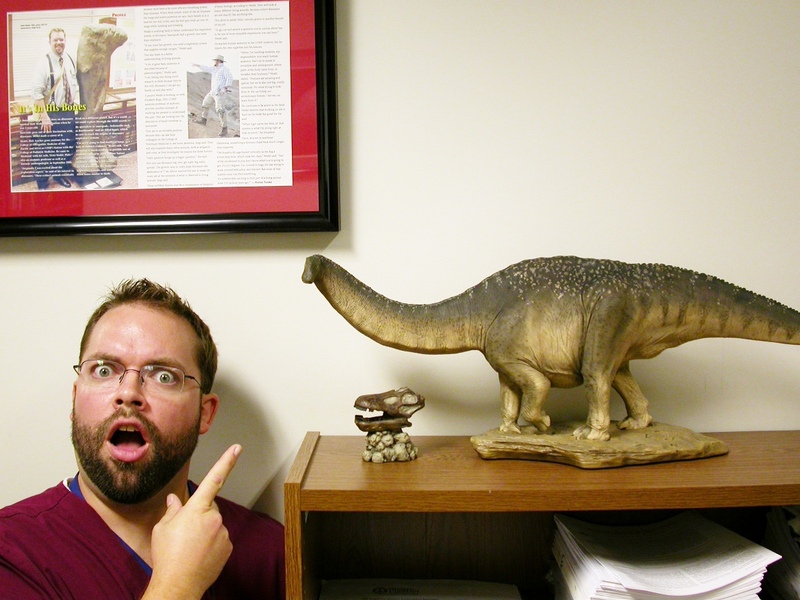 And it’s in every sauropod sacrum I can remember seeing with my own eyes, including Brachiosaurus altithorax. And yet the only authors I can think of off the top of my head who have discussed it seriously are Gilmore, Greg Paul, maybe Jim Jensen, and IIRC Salgado et al. 1997. If there are more, please let me know–this is something I’m very curious about. I know you must like Sideshow Apatosaurus maquette very much, but if you consider to sell it one day…please don’t hesitate to contact me!! I like it very much…and I’ll offer you a good price as much as I can!! Thank you.